Thompson Cascade tapestry shows a work based on the art by artist Albert Bierstadt (1830-1902). Founding the Rocky Mountain School of Landscape Painting, his works feature his hallmarks of natural scenes in beautiful light. Here in this scene also known as Thompson Cascade, White Mountains, we see a rocky formation with water cascading down to a rockpool of beautiful rust color. The trees above hint at this setting of the forest of a national park. The light beautifully illuminates the tree, rocks and pool to create an almost surreal effect. 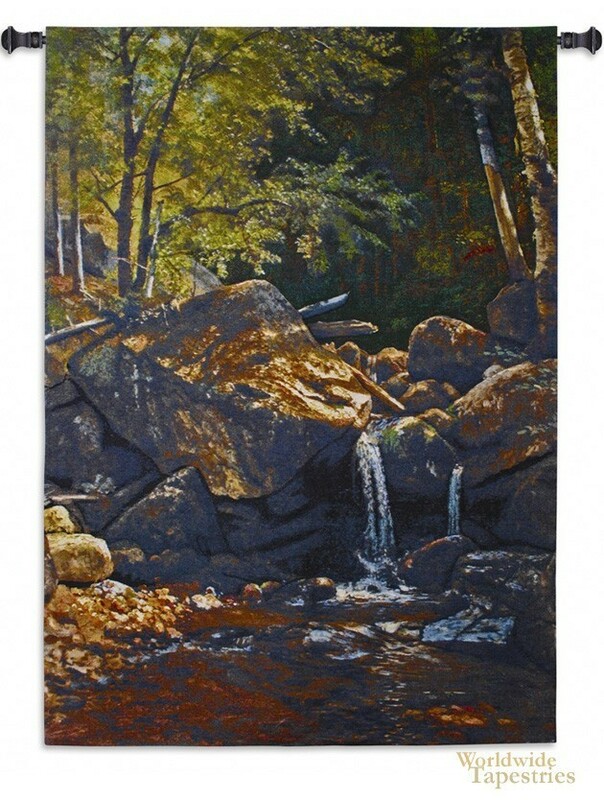 This Thompson Cascade tapestry is backed with lining and tunnel for easy hanging. Note: tapestry rod, where pictured, are not included in the price.